In any stage of your startup, you want it to grow, gain as many users as possible, and, of course, engage the existing ones. Mark Zuckerberg said ‘move fast and break things’. In order to do this, you need to create a user acquisition strategy for applications or websites. So, it’s high time to discuss this idea more precisely. 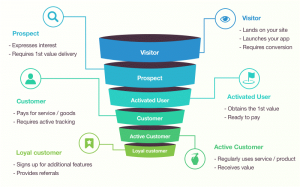 The first thing for you to know is Customer Lifecycle Funnel. In marketing and sales spheres, it is represented as a vertical scheme. As you can see, the client needs to pass six stages. User Acquisition is the process of converting a visitor into an active customer. It’s sad that a lot of users utilize your product only once. All the actions you take to turn users into customers are called User Engagement. As you understood, these two options are vital for startup success. User acquisition and engagement are not predictable. Of course, it doesn’t mean that that planning is unimportant. In order to eliminate some risks, it’s better to be prepared for problems that can appear. Defining your target audience. There is a good piece of advice. It’s necessary to consider two different audiences: current and ideal. It’s obvious that your current audience is clients that you already have. As for ideal one, it’s all about customers you want to have. You are able to define your current audience using social media or analytical tools. On the other hand, you have to do some research to find your ideal one. Consider the power of the first impression. Responsive web design is vital because more users prefer to use mobile devices while surfing the web. Of course, you doubt about the necessity of developing a beautiful UI at the first stages. However, creating UI will give you a lot of benefits. So, it’s important to follow the latest design trends. There are some examples. Purposeful animation. Browsers have a lot of new capabilities. That’s why there are a lot of opportunities for motion design. Customers perceive motion much better than lighting, positioning, and materials. 3D visualization. This trend is quite good for product companies with complex processes. 3D visualization allows you to tap into any tech process and create a better understanding. Gradient, blazing colors, etc. New technologies have changed screens. Now they have a fantastic rendition of colors. Gradient 2.0 is quite simply because it utilizes no conflicting colors. Keep in mind mobile technology trends in 2019. There is still a trend to implement artificial intelligence in software. AI can be used in different spheres in order to do routine things faster and better than human beings. In order to develop a bot that is able to teach itself and follow conversations like a person, it’s important to use speech recognition and machine learning. Moreover, a lot of attention is paid to data safety. Personal data is vital and should be well protected. Gradually immerse users into your product functionality. It’s obvious that you don’t need to load users with every feature that your product has. It’s better to let users discover what is useful for them. Another variant is to schedule the promotion of the product features and updates as well as announce them with ads. Talk to users. Communication with your customers will give you an opportunity to get their feedback and use it for future improvements. Measurement affects the chosen strategy for engaging clients. The main principle that all startups should follow is to analyze and optimize. Let’s discuss them more precisely. It’s necessary to begin by identifying your purpose. After that, you will be able to find fields that are important to monitor. At the stage of user acquisition and engagement, you need to build a customer funnel. Moving from one step to another in the funnel, you have to monitor three core metrics at most. For instance, while converting a visitor into a prospect, it’s vital to pay attention to the total number of visits, the percentage of users that have subscribed to your emails, and open your welcome letter. There is also a good tip for you to use. During selecting the metrics, ensure that they are tied to measuring user engagement. If not, it’s better not to waste time on them. The best way to analyze is to utilize some analytics tools like Google Analytics. These tools are able to track any changes that are happening to your products. For instance, view traffic, sources, set up goals, etc. There is one more interesting and important tool — WebVisor. It allows analyzing visitor behavior. So, you are able to track mouse movements, clicks, text copying, etc. Testing and trying new variants of the UI on the landing page or app are important. There is always a place for improvement. For example, you can change the design in order to increase the readability and so on. Nobody is able to provide you with the best way of optimization because your products are unique. For sure you need to know your audience and develop the right funnel. There are a lot of different variants for your startup to acquire and engage customers. So, try new variants and analyze the received results. Sergey Lypchenko is a technical writer at Cleveroad company that offers mobile and web development services. Our main goal is to develop first-rate and competitive software for our customers. My mission is to provide people with interesting material about innovations in the world of IT.